A great gift idea for a food lover, to spend as they like in our organic online shop. From veg and fruit to meat, wine and chocolate – all sorts of tasty treats to tempt. All organic and grown on our farm or by our brilliant growers and makers. 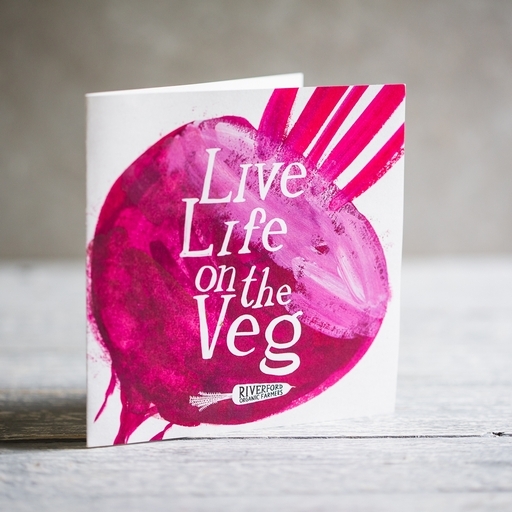 The veg-adorned voucher opens into a card with a space for your message. We’ll post it to you separately. Anything we can’t grow or make ourselves comes from our trusted farmers, growers and makers here in the UK and overseas. Having ourselves grown veg for the supermarkets years ago, we know too well the insecurity that comes from being without a guaranteed market for your produce. So we work together over the long term, building relationships based on trust and fairness. Everything we sell is certified 100% organic, except our wild fish.